ROME (CNS) — The bishops of the Northwest began their “ad limina” pilgrimage at the tomb of St. Paul, praying for courage to proclaim the Gospel like he did. 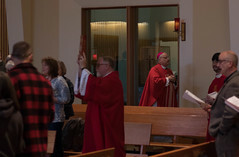 Dressed in red vestments in honor of the martyred apostle buried at Rome’s Basilica of St. Paul Outside the Walls, the bishops of Washington, Oregon, Idaho, Montana and Alaska chanted the creed in Latin and reflected on what faith calls them to do. 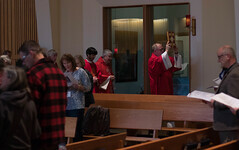 Archbishop Roger L. Schwietz of Anchorage was the principal celebrant and homilist at the Mass April 23. A handful of seminarians from the North American College and visitors to the basilica — either thrilled to find bishops celebrating a Mass in English or just curious about the sight — joined them. The archbishop said it was “a tremendous honor” to celebrate the Mass with his fellow bishops, especially at the tomb of St. Paul, who has had a significant influence on his life. “I grew up in St. Paul with its great cathedral; I chose Paul as my confirmation name,” he said, and he took a line from St. Paul’s Letter to the Ephesians, “Jesus Christ Is Lord,” as his episcopal motto. The visits are an opportunity for the bishops to share their experiences with one another and with Pope Benedict XVI and his collaborators at the Vatican and to learn from their experiences and insights, the archbishop said. In the Gospel story, the archbishop said: “First comes belief. And we come together as a group of disciples, asking the Lord to confirm our belief and strengthen it so that our zeal may be like the zeal of Paul to make the Lord Jesus known” and to proclaim the truth.